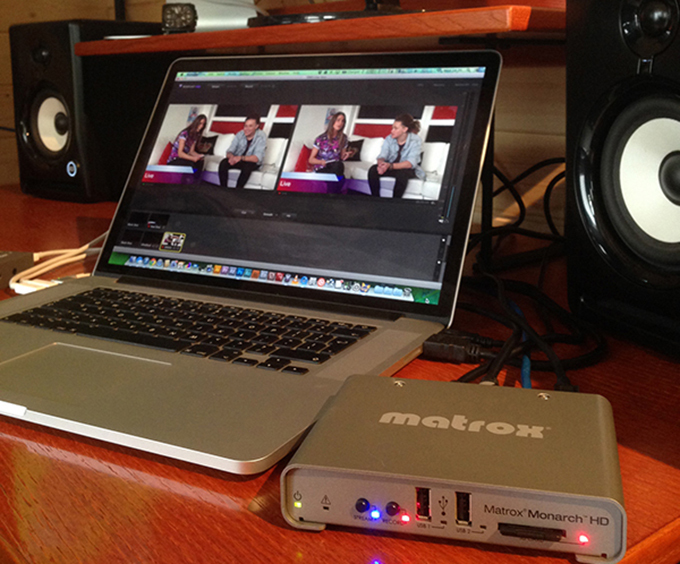 Matrox Monarch HD is the video streaming and recording appliance for the first live underground music site of its kind, DMO Live (Don't Miss Out), a new platform that records and live-streams international music parties, exclusive artist interviews and festivals direct to the DMO website. Created for the electronic music lover, DMO (www.dmolive.tv), will soon connect venues in different worldwide locations through one live event by streaming the night's main happening on large screens in club locations around the world. The aim is to create the world's first virtual club night/music event. The site will also present virtual parties where members can interact with their favourite DJ's and attend dance parties regardless of their location. The Base Post Production, a London-based post production house responsible for live streaming the iTunes festival and Live Nation events, is spearheading all video production for DMO. "Because of the frequency of our video streams from the various DMO locations and how often we'll be on the move, the directors at The Base Post Production strongly suggested we use the Monarch HD device,"said Mason Roberts, Founder of DMO. "Setting up encoders, vision mixers, etc. at each location would prove far too time consuming and more expensive than we can afford. They recommended the Monarch HD technology because of its simplicity and high quality HD recording. It'll make what could have been a complex and cumbersome operation into something that almost anyone can host themselves." Matrox Monarch HD is a cost-effective, small, and easy-to-use H.264 encoder that was designed for video producers who need to simultaneously stream a live event and record a mastering-quality version for post-event editing. "This will not only simplify our set up, it allows us to become more versatile in where we can stream from and saves us money by automatically recording what we stream and removes the need for external help when setting up at each location,"continued Roberts. "Our initial plans for the technical set up were extremely complicated and would not have been cost effective at all." The right technology is critical to the success of DMO, according to Roberts: "We believe that with the latest in audio and visual streaming technology, we can bring this concept to the world in a way that'll make it hugely popular internationally. We'll typically stream our live content at 1-2 Mbps, and we can record it at full HD resolution at up to 25 Mbps. Thanks to our Matrox system, we can create high-quality assets that we host on our site, ensuring our visitors are downloading our VOD content in pristine quality. The DMO site and the events it covers will provide a great marketing tool for artists and brands by reaching out to all fans, including those in locations that a tour may not typically visit. The ability to provide our audience with dynamic, high-quality live and recorded video is key to our future." If the popularity of DMO proves all that Roberts expects, he plans to expand his use of Matrox products. "The possibilities are endless,"he said. By separating the task of recording from streaming in a single integrated unit, the Matrox Monarch HD ensures that Content Delivery Networks (CDNs) are focused on delivering quality video while the operator controls the quality of the archive. From any HDMI input source such as a camera or switcher, Monarch HD generates an H.264-encoded stream compliant with RTSP or RTMP protocols. While encoding the video at bitrates suitable for live streaming, Monarch HD simultaneously records a high-quality MP4 or MOV file to an SD card, a USB drive, or a network-mapped drive. It is remotely controlled using any computer or mobile device with a web browser.